The jellyfish often encountered in the Chesapeake Bay in the summer is the sea nettle Chrysaora chesapeakei. Knowing where and when to expect this biotic nuisance may help to alleviate an unpleasant encounter. Up until recently in 2017, Chesapeake Bay sea nettles were believed to be the same species of nettles that occur offshore in the Atlantic Ocean. A team of scientists discoverd it is actually a distinct species and named it Chrysaora chesapeakei to distinquish it from its ocean cousin, Chrysaora quinquecirrha . For more information, please see New jellyfish species discovered hiding in plain sight. Chrysaora chesapeakei is white and occurs most abundantly in the tributaries of the middle Bay, where salinities range from 10 to 20 parts per thousand (ppt). In the southern Bay, it often has red/maroon markings on the long central tentacles and on the swimming bell. The maps are experimental and depict the probability of encountering the sea nettles, Chrysaora chesapeakei in the Chesapeake Bay and its tributaries. The density of sea nettles that you may encounter is not reflected here because it can vary greatly from year to year at a given location and would be a much less reliable prediction. 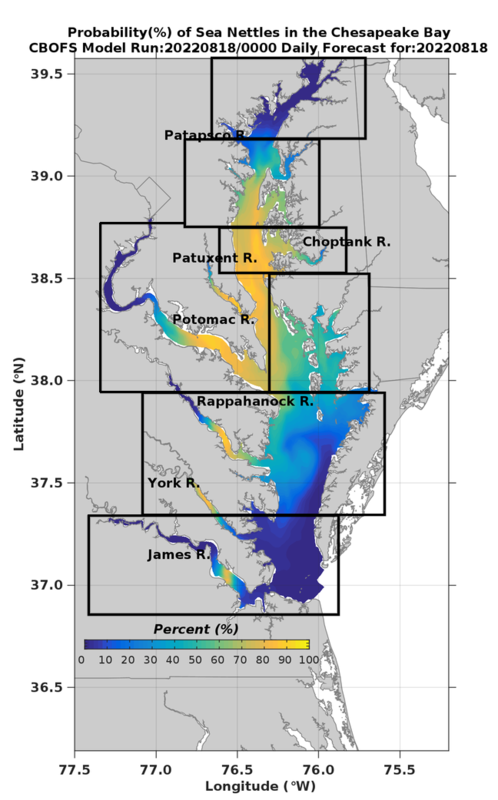 These probability of encounter maps are generated for the Chesapeake Bay Office of NOAA's Fisheries Service by the National Centers for Environmental Prediction and the National Ocean Service. These maps are numerical model guidance only; they are not fully validated and may not reflect actual conditions. Additional sea nettle information, including the method to calculate encounter rate of sea nettles in the Bay, is available from the NOAA Chesapeake Bay Office Sea Nettle forecasting web site. Contact NOAA with any comments or inquiries.